I am honored and inspired to run the 2019 Boston Marathon on behalf of my patient partner, Sammy, his family, and the Credit Unions Kids at Heart team. Sammy was diagnosed with Cornelia de Lange Syndrome (CdLS) at birth. His parents found out that he did not have hands when his mother was 18 weeks pregnant. He was born a month early at 3lbs 10oz. 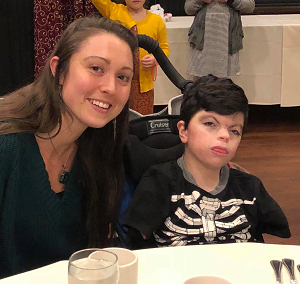 During the first year of Sammy’s life he had several surgeries, and from there on it was at least one surgery a year for various reasons all associated with CdLS. Although Sammy does not walk independently, he is able to scoot on his bottom. He is nonverbal but is learning to communicate through a new device. Sammy is almost 13 and is a loving, joyful child who gives amazing hugs. He also has an incredible head of hair! If someone told me a few years ago I would be volunteering myself to run a marathon, I would have told them they were crazy. But being a part of this team is not about the running. It is about the medical breakthroughs that the Boston Children’s Hospital researchers are making to improve and save lives of children like Sammy. The special partnership with Credit Unions Kids at Heart has helped the Boston Children’s hospital make discoveries and bring cures closer for children with Moyamoya Disease, Sturge-Weber Syndrome, Cerebral Palsy, Pediatric Brain Cancer, and Epilepsy. All donations are greatly appreciated, tax deductible, and 100% of the money raised goes directly toward research. Boston Children’s Hospital changes lives every day, and your generosity and compassion will bring cures closer for these children. On behalf of Sammy and all the kids receiving care at the Boston Children’s Hospital, thank you!